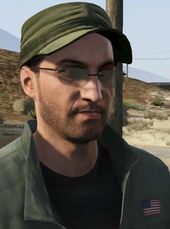 Josef is a character in the HD Universe who appears as a Strangers & Freaks character in Grand Theft Auto V. He is voiced by Sergey Nagorny. Josef, originally born in Russia and later immigrating to Blaine County after marrying Yellow Jack Inn bartender Janet, is a co-founder of the Civil Border Patrol along with his superior Joe. Despite being an immigrant himself and speaking no English, he teams with Joe to hunt illegal immigrants who they hand over to the local police for them to determine their immigration status. The two use stun guns to apprehend those they believe to be illegal immigrants. In 2013 Joe and Josef hire Trevor Philips who helps them apprehend a mariachi band, Manuel and two other suspects. Manuel, an American citizen, is later released and has Trevor kill Joe and Josef. Trevor tracks them down to a farm where they are attempting to apprehend a family. This page was last modified on 2 September 2014, at 19:44.